A UMNS photo by Erma Metzler. Susan Boyle, the Scottish singer who became an overnight sensation, is 47. The Rev. Charlene Harris Allen, pastor of Walkerton United Methodist Church in northern Indiana, is 48. Boyle says she never had a chance for stardom until she auditioned for the television show “Britain’s Got Talent.” Allen was a professional singer before losing her voice at age 18 and is only slowly working her way back to prominent stages in the United Methodist Church. 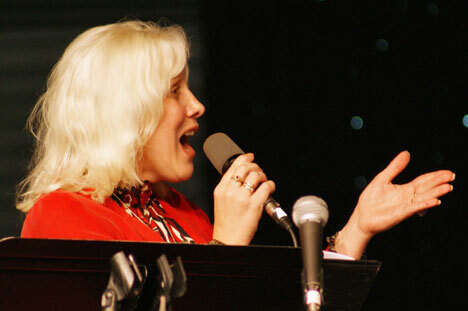 The ability and desire to sing, Allen said, is a legacy passed down to her generation by generation. Her great-grandparents on her mother’s side sang in burlesque halls in the Midwest before they became Christians and settled in an evangelical Protestant church. Her mother sang in the church choir, and Allen did as well. She would become the lead singer in a rock ‘n’ roll band, leaving the church for a while. At age 18, she lost her voice when a cyst formed in her throat, the result, she believes, of performing in smoky clubs and abusing her voice to perform rock or disco anthems. She returned to The United Methodist Church, where she met her future husband. Her voice also returned. With the encouragement of church leaders—such as her former associate pastor, the Rev. Kaye Patton, then at St. Paul’s United Methodist Church in Elkhart—she would move into the spotlight at regional church meetings. Her success ministering to people with song led her to go to seminary in her 40s. She will be ordained an elder in June. If there was one moment when her ministry and music all came together, it may have been at the North Indiana Annual Conference last year. The North and South Indiana conferences had voted to combine into one body and this was the last time the North Indiana Conference would be held at Purdue University in West Lafayette. For the first time in her singing career, she did not feel butterflies in her stomach. When she sang “Upon This Rock,” Allen said she could not only feel conference members take comfort for the uncertain journey ahead, but also sensed a powerful outpouring of the Holy Spirit. Susan Boyle, welcome to the world of Charlene Allen. *Briggs is news editor of the United Methodist News Service. News media contact: David Briggs, Nashville, Tenn., (615) 742-5472 or newsdesk@umcom.org. Q: What is the nicest thing anyone has ever said to you about your singing? A: I think, probably one of the nicest things was that they felt closer to God. Q: What is your favorite church song? Q: Do you sing in the shower? Q: Who would you compare yourself to as a singer? A: I always loved Barbra Streisand, and did her music for a while and still do. People have compared me to Barbra Streisand and Sandi Patti. I think I sound like me. Q: What song would you choose at a karaoke party? What about United Methodists who can’t sing? Your Spam Blocker might not recognize our email address. Add InfoServ@umcom.org to your list of approved senders.